Choose from a variety of material thickness meter, mil gage or paint meter products used for the non-destructive measurement of nonmagnetic coating, insulating layer and dry film thickness (DFT) on ferrous and / or non-ferrous metal substrates such as steel and aluminum. Explore PCE Instruments' selection of accurate, affordable material thickness meter, coating thickness gauge, surface testing and film gauge devices used for automotive paint inspection, material testing and manufacturing quality control applications. A material thickness meter is an essential quality assurance tool when anodizing, galvanizing and applying zinc coating to metallic surfaces. A material thickness meter also is used to measure body paint thickness and uniformity on pre-owned cars, revealing repainted spots, identifying hidden damages and exposing undisclosed accidents. This information is important when determining the actual value of a used car. 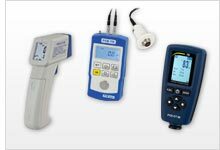 In addition, certain types of thickness meters can measure wall thickness and determine the hardness of metals, plastics and glass. The PCE-CT 25 Material Thickness Meter is used for quickly detecting the thickness of metals, such as steel and iron (F) as well as non-ferrous metals (N) in the automotive sector. The PCE-CT 25 Material Thickness Meter is used to detect damages in cars (the coating thickness of paint can say if the car has suffered any damage) to establish if the car has been in an accident and the resulting value of the car in the used car market. The PCE-TG 100 is a compact material thickness meter for homogeneous materials. This material thickness meter PCE-TG 100 works with an external ultrasonic probe; this probe conducts ultrasonic waves into the material to be tested. Different materials conduct ultrasound at different speeds, so you can choose different ultrasonic speeds on the PCE-TG 100 Material Thickness Meter. The material thickness meter PCE-TG120 is a very easy-to-use wall thickness gauge for all materials. This material thickness meter works to accurately measure the material thickness / wall thickness with ultrasound. The material thickness meter PCE-TG 110 is a thickness gauge with external high-temperature probe for ferrous and non-ferrous metals etc. The PCE-TG 110 is an ideal material thickness meter for water pipes, steam pipes and pipes for chemicals. PCE-TG 250 is a portable Material Thickness Meter with an easy-to-read 4-digit display. This ultrasound-based Material Thickness Meter uses a contact transducer (included) to measure the thickness of coated and uncoated ferrous and non-ferrous metal, glass, plastic, and other homogeneous materials including aluminum, brass, copper, iron, lead, nickel, steel, gold, titanium, pyrex and quartz glass, nylon, polyethylene, and silicone rubber. PCE-CT 65 is a material coating thickness meter that uses magnetic induction (ferrous) or eddy current (non-ferrous) to take non-destructive measurements of coating and dry film thickness (DFT) on metal substrates such as steel and aluminum. This thickness gauge is ideal for painted and powder-coated surface testing, automotive paint inspection, coated material testing, and manufacturing quality control applications. PCE-CT 65 is a material coating thickness meter that uses magnetic induction (ferrous) or eddy current (non-ferrous) to take non-destructive measurements of coating and dry film thickness (DFT) on metal substrates such as steel and aluminum. This thickness meter is ideal for painted and powder-coated surface testing, automotive paint inspection, coated material testing, and manufacturing quality control applications. PCE-CT 100 is a material coating thickness measuring instrument used to quickly and easily determine coating thicknesses on ferrous (Fe) and non-ferrous (nFe) metals. This compact handheld coating thickness gauge uses magnetic induction (ISO 2178) and eddy current (ISO 2360) coating thickness measurement methods to take non-destructive measurements of coating and dry film thickness (DFT) on metal substrates such as steel and aluminum. PCE-CT 5000H is a material coating thickness measuring instrument used for the rapid determination of coating thicknesses on ferrous (Type F) and non-ferrous (Type N) metals. The material coating thickness meter or gauge automatically detects the type of metal to be measured. PCE-CT 5000H is a material coating thickness measuring instrument used for the rapid determination of coating thicknesses on ferrous (Type F) and non-ferrous (Type N) metals. The coating thickness meter automatically detects the type of metal to be measured. The PCE-CT 28 Material Thickness Meter for cars is for measuring the thickness of paint and plastic on ferrous or non-ferrous materials without damaging the coating's surface. The Material Thickness Meter stands out due to its high range of measurement. PCE-CT 27FN is a Material Thickness Meter that takes non-destructive measurements of nonmagnetic coating, insulating layer and dry film thickness (DFT) on metal substrates such as steel and aluminum. Ideal for surface testing, automotive paint inspection, material testing and manufacturing quality control applications. The PCE-CT 5000 Material Thickness Meter is an instrument for a nondestructive thickness measurement of coatings, such as varnishes, paints, etc. on steel / iron and non-ferrous metals. The extremely wide measuring range of the Material Thickness Meter goes up to 5000 µm or 200 mils. Gumming or plastic coatings for shock and impact protection can be controlled just as the thin paint coatings. The PCE-CT 40 is a Material Thickness Meter that takes non-destructive measurements of nonmagnetic coating, insulating layer and dry film thickness (DFT) on only ferrous metal substrates such as steel. Ideal for surface testing, automotive paint inspection, material testing and manufacturing quality control applications. PCE-CT 50 is a Material Thickness Meter that takes non-destructive measurements of nonmagnetic coating, insulating layer and dry film thickness (DFT) on only non-ferrous metal substrates such as aluminum, brass, stainless steel and anodized aluminum. Ideal for surface testing, automotive paint inspection, material testing and manufacturing quality control applications.